In the midst of the controversy over women’s right to lecture against slavery, Angelina married fellow abolitionist Theodore Dwight Weld on May 14, 1838 in Philadelphia. Though Weld viewed the issue of women’s rights as damaging to the anti-slavery cause, his marriage vows acknowledged Angelina’s equality. 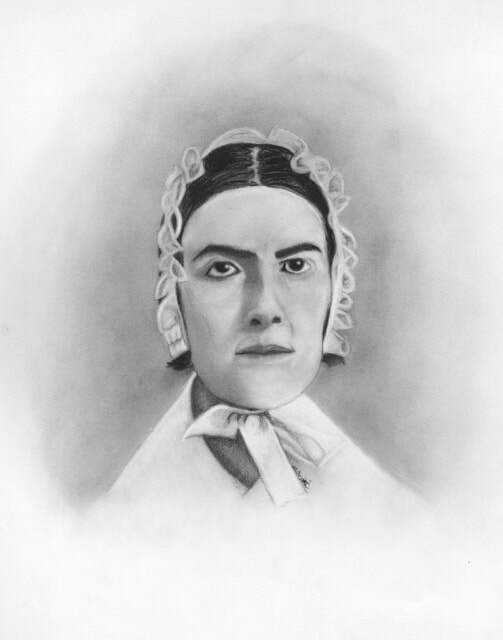 Three days later, with a furious mob surrounding the building, Angelina addressed an integrated audience of abolitionists in the newly opened Pennsylvania Hall. She argued that the hostile crowd demonstrated “that the spirit of slavery is here” and northerners must purify their own hearts before converting the south. Her willingness to fight for racial equality as well as abolition only incensed the mob. The next day, the rowdies set fire to Pennsylvania Hall and destroyed it. As abolitionist women prepared to exit, Angelina proposed that white women link arms with African American women present in order to protect them from physical violence. Years later, Lucretia Mott, the Quaker minister, women’s right’s activist, and abolitionist, described Angelina’s career as “a flash” and her marriage an “effectual extinguishment.” While Angelina and Theodore both saw their marriage as a retirement from internal and external conflicts that divided the anti-slavery movement, Mott exaggerated their disappearance. In 1839, they published American Slavery As It Is, which included evidence from southern newspapers showing the violence and brutality of slavery. As native southerners and former slaveholders, Angelina and Sarah also contributed their own firsthand testimony. In 1848, with Theodore and Sarah, Angelina found another way to contribute to the anti-slavery movement, opening a school on their farm in Belleville, New Jersey. By 1853, they moved the school to the Raritan Bay Union, a utopian community, and renamed it Eagleswood. Dedicated to educating future reformers, this co-educational and integrated school enrolled the children of their fellow abolitionists. After the Civil War, Angelina and Sarah welcomed into the family two mixed-race nephews, Archibald and Francis Grimké, the sons of their brother and one of his slaves. These nephews, like their famous and controversial aunt, also became prominent leaders of the movement for racial equality.